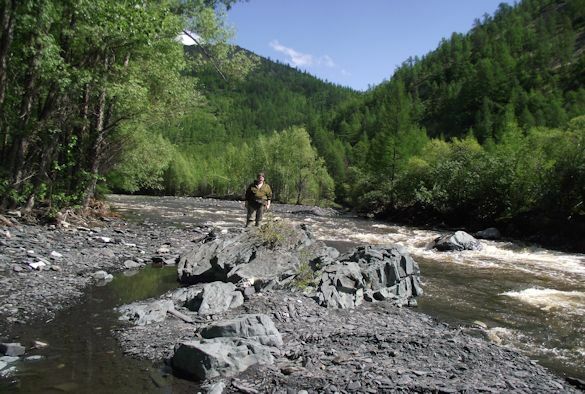 “As part of our labs ongoing collaboration with the Institute of the Physics of the Earth (IPE) at the Russian Academy of Sciences, I was invited to join a fieldwork expedition to the Sette-Daban mountain range in Eastern Siberia. I started my trip by travelling to Moscow to visit their geomagnetic lab and meet with the head to the lab, Vladamir Pavlov, whom I would be travelling with. From Moscow, we took a 6 hour flight to Yakukst, the capital of the region and famous as being the coldest city in the world of its size and greater as it will happily reach -50°C in the winter, although it seemed impossible standing in the near +30°C heat I experienced on my arrival. Here we met up with the rest of our group; Andrey Khudoley, from St Petersburg University, along with three of his postgraduate students and Sasha, a local taxidermist who was also our driver for the trip. 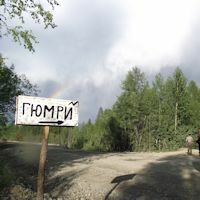 From Yakukst it was three days drive along the Kolyma Highway, better known as the “Road of Bones” to our field site. The road was originally built by the forced labourers whose bones are said to be mixed into the foundations giving the road its name. While we didn’t see any bones but Sasha was able to show us the remains of some of the camp buildings; buried so deep within the trees they aren’t visible from the road. 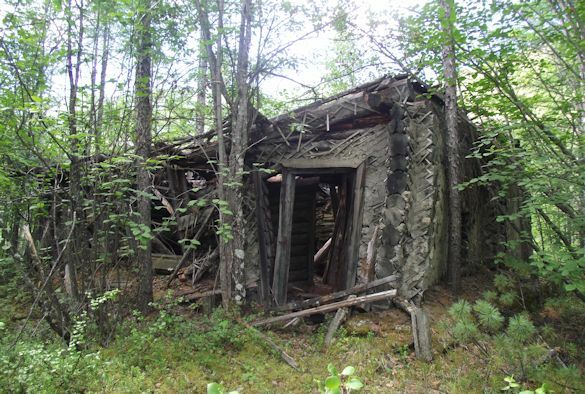 It was difficult to see how anyone could have survived in those buildings during the Siberian winters. Once we got there we set up camp, although this first camp didn’t last long. 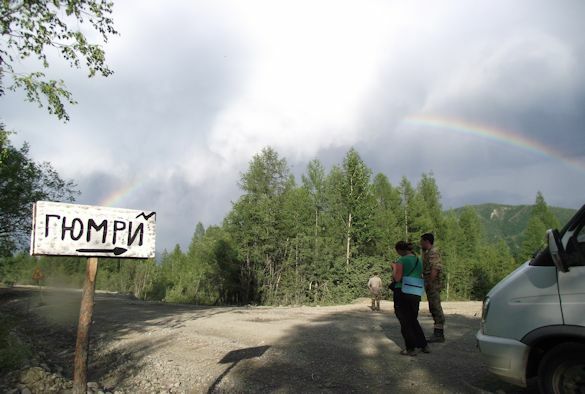 It’s common for the Russian geologists to camp on the river banks, usually because they travel by boat, and after a night of heavy rain it was a mad dash to get everything out before the camp flooded the next morning. After this, the next 10 days of camping seemed pretty relaxed. Before Sette-Daban range was created, the area was affected by the Yakukst event; a mantle plume that caused continental break-up, extensive volcanism and the formation of multiple dike swarms. The amount of magmatic material produced is such that it has been suggested as the cause of an extinction event that occurred around the same time, 370million years ago. These lavas and dikes were the targets of our trip as they are excellent recorders of the Earth’s past magnetic field. This is because they contain abundant iron (and titanium) oxides that are magnetic and will align with an external magnetic field (such as the Earth’s). When the rocks are hot, they can align with the field easily but as they cool down it as there is less energy available for the magnetic minerals to align and the properties of the past magnetic field are essentially “frozen” in the rock. Our first objective was to identify suitable sites for sampling where these volcanic rocks were still in situ, which required a lot of wading through rivers. Once located, we took a number of orientated hand specimens from each location to take back to the lab. Back in the lab, we can use our new 2G RAPID system magnetometer to measure the direction of the field preserved in the samples, which can be used to determine where the Siberian continent was located on the Earth 370 million years ago. We can also measure the strength of the Earth’s past field using the 2G and Liverpool’s unique (we’ve got the only two) Microwave paleointensity systems.